The occupying Sinhala military in Mullaith-theevu installed a small Buddha statue, which was covered with glass at the disputed heritage site of Neeraaviyadi-eattam in Chemmalai in November. The SL military has now hurriedly replaced it with a huge Buddha statue disregarding the interim order and the protests of Tamil residents. The move comes after a delegation from the SL Archaeology Department in Colombo visited the SL military prompting it to accomplish the mission, civil sources in Mullaiththeevu District Secretariat told TamilNet. An extremist Buddhist monk, Kolamba Medhalankara Thera, staying with the SL Army's 593rd Brigade at Naayaa'ru is operating with the thinking that once the giant statue has been successfully erected, Tamil protests, as well as the interim orders, would lose their impact as the SL Constitution accords ‘foremost place to Buddhism’, the sources further said. The SL military is preparing for a grand opening of the Buddha statue at the heritage site of Tamils at Neeraaviyadi in Mullaith-theevu. Tamil residents say that the Sinhala military and the extremist Theravada Buddhist monks have openly violated interim order by the SL court using the current turmoil in Colombo to their favour. Photo taken on 12 December 2018. The Tamil people in Chemmalai East have been protesting against the repeated attempts by the SL military to bring survey department officials to demarcate the planned expansion of the vihara establishment. The Tamil residents who oppose the move have also been demanding access to their temple. They went ahead with a Pongkal feast on the 10th of September at the Pi'l'laiyaar temple, which has been absorbed into the Buddhist vihara being schemed at the lands which are also claimed by the SL Archaeology Department. Neeraaviyadi (Pazhaiya-Chemmalai) is an ancient village with traces of heritage artefacts. It is a coastal hamlet located on a narrow sandbar, which is sandwiched between the Naayaa'ru lagoon and the sea in Karai-thu'raip-pattu division of Mullaiththeevu district. A'lampil is situated to its north and Kokku'laay lagoon is at its south. The SL Army's 593 Brigade, which is having its ‘headquarters’ at Naayaa'aru in Mullaith-theevu, established the so-called Gurukanda Purana Raja Maha Vihara (Gurukanda RMV) in 2009. The expansion seeks to absorb a traditional Hindu temple worshipped by Eezham Tamils at the locality, which lies sandwiched between Naayaa'ru lagoon and the sea. It was during the times of Mahinda Rajapaksa's regime in 2013 the area was gazetted as the property of SL Archaeology Department. 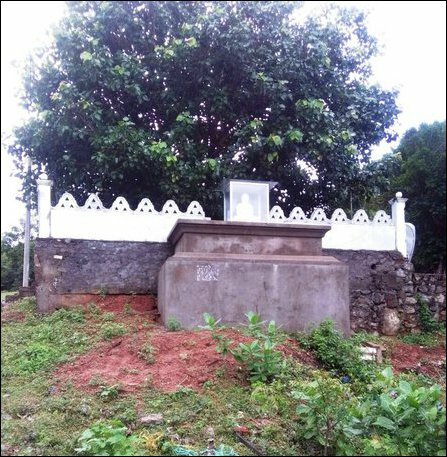 Génocidaire SL commander Maj. Gen. Jegath Dias and the late Seruwila Saranakiththi Thera worked closely to brand the ancient remains at Naayaa'ru, possibly the traces of Mahayana Tamil Buddhist heritage, as traces of Sinhala Theravada Buddhism. Jegath Dias played a leading role in the onslaught on Vanni with command responsibility for Divisions 53, 57, and 59, and Task Force IV initiated the vihara project after May 2009. The late Seruwila Saranakiththi Thera, who was the Anunayake of the Seruwila Saranakiththi Kalyani Sect and Chief Incumbent of the Mangala Raja Maha Viharaya in Seruwila at that time, was the one behind the Maavil-aa'ru controversy in Trincomalee towards scuttling the Ceasefire Agreement in 2006. Seruwila Saranakiththi Thera was used by the SL military intelligence to escalate the situation through a hunger-strike at that time. The monk stationed now at Gurukanda RMV, Kolamba Medhalankara Thera, is also groomed by the occupying Sinhala military, mainly by the troops of the 19 Gemunu Watch (GW), which comes under the 593rd Brigade of SLA's 59th Division. Colonel Lanka Amarapala is the Brigade Commander of the 593rd Brigade, which is hurriedly converting the locality into a Sinhala Buddhist vihara. The Sinhala monk, claiming the establishment as Gurukanda, has been collecting the belongings of uprooted Tamils and claiming these as heritage artefacts from an ancient Sinhala Buddhist settlement of their imagination, Tamil residents say. In the meantime, the SL Mahaweli ‘Development’ Authority has also been targeting to seize the lands and convert them into a Sinhala colony in the long run through the so-called L Scheme. 09.07.18 Antiquities Ordinance used to justify Sinhalicisation of 48 ..
13.01.19 Tamil refugees returned from India languish for se..
12.01.19 Colombo accelerates Sinhalicisaton of disputed her..
12.12.18 SL military erects giant Buddha statue at controve..
05.11.18 SL military defies court order, erects Buddha stat..
23.10.18 SL Police steps up harassment of Tamils after Sinh..
05.10.18 Rajapaksa ally vows to erect Buddhist viharas in V..
02.10.18 SL Archaeology Department's collusion with intrudi..
13.09.18 Tamils confront Colombo by reviving deity rituals ..